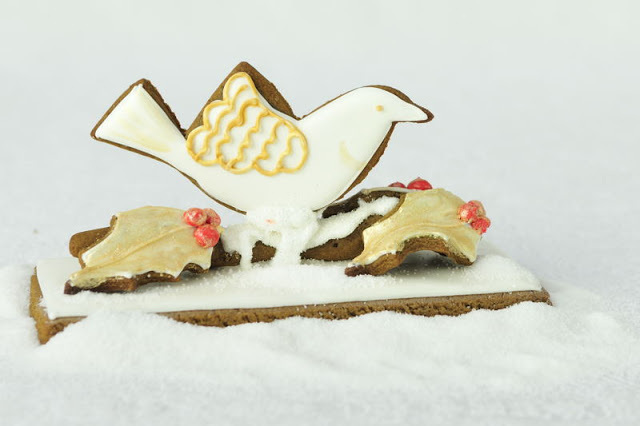 Image of dove has been part of Christmas for many years, centuries actually. It symbolizes peace, purity, love and freedom. I wanted to recreate Christmas Dove symbol into a cookie centerpiece, using gingerbread dough, icing and sanding sugar. Here is what I came up with. Gingerbread dough for centerpieces and constructions, bakes hard, not recommended for eating. powder/baking soda may change cookies in size slightly once baked. and a template cookie cutter for the base. Size of the base depends on how long you make the holly branch so it can fit comfortable on the base. 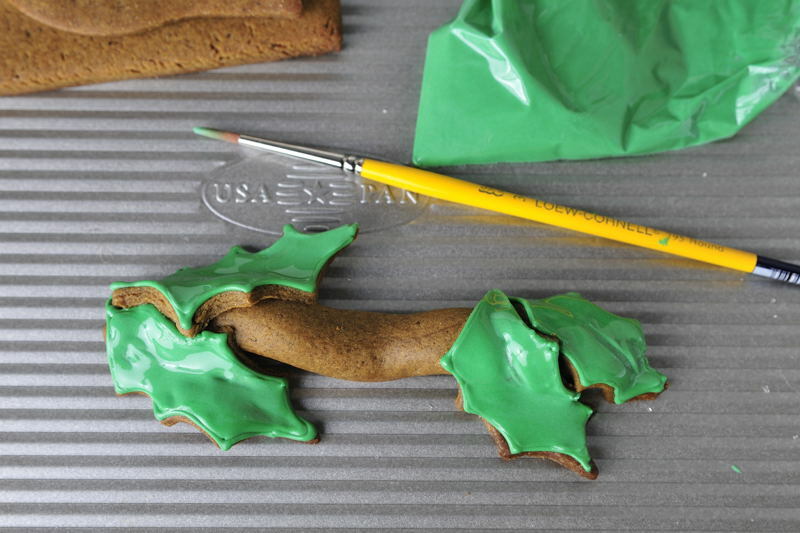 Make a small rope shape/branch from the cookie dough(roll the dough with the palms of your hands), cut out holly leaves. Using little bit of water attach holly leaves onto the branch. 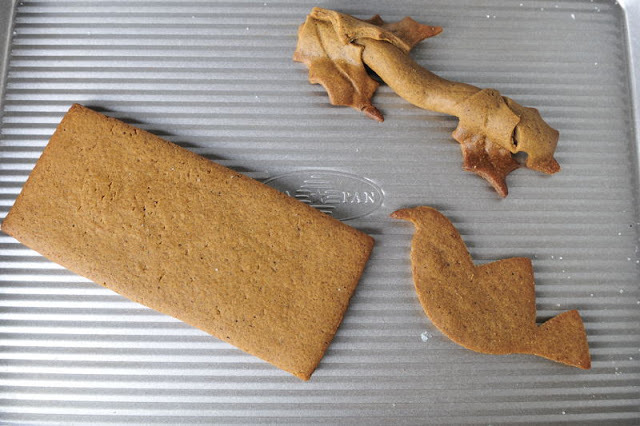 Bake cookies formed on piece of rolled parchment, I used 2 metal cookie molds sprayed with nonstick spray. 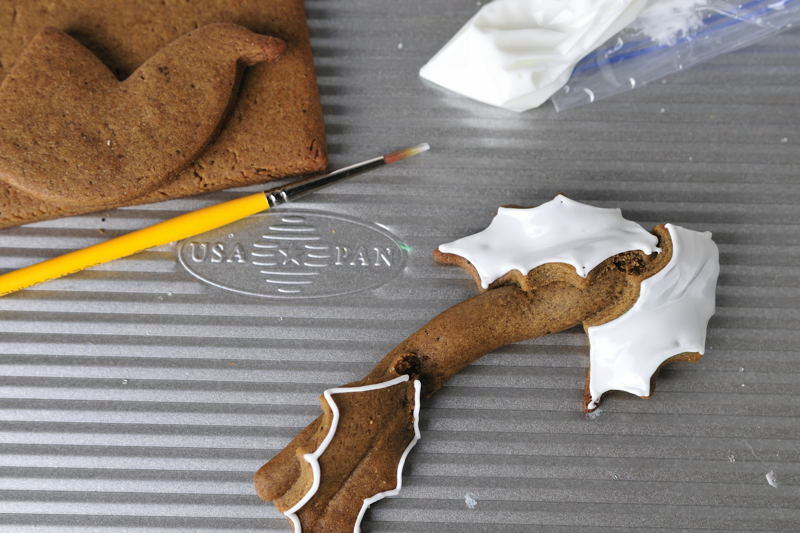 Once cookies are baked leave them cool completely on your molding support. 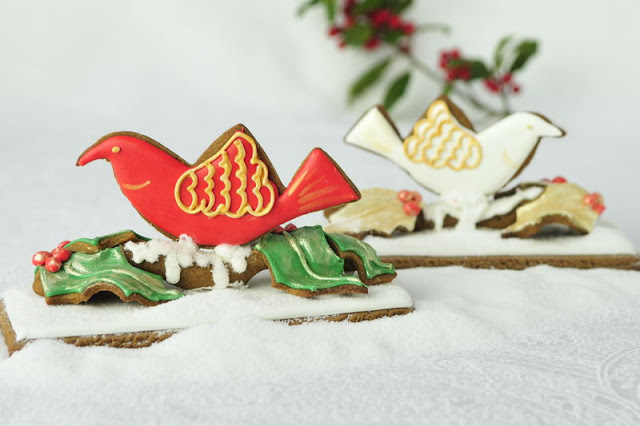 Once cool you can decorate cookies. 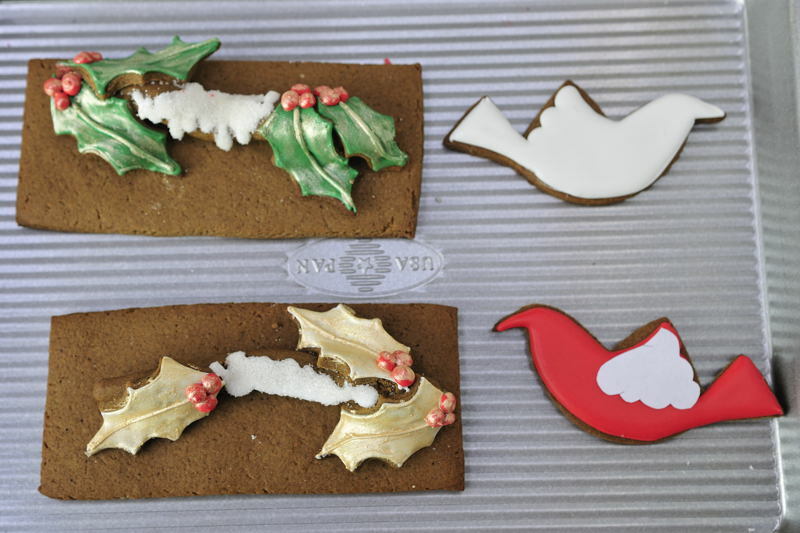 I ended up outlining holly leaves and then using a small brush I spread the icing to coat the cookie. 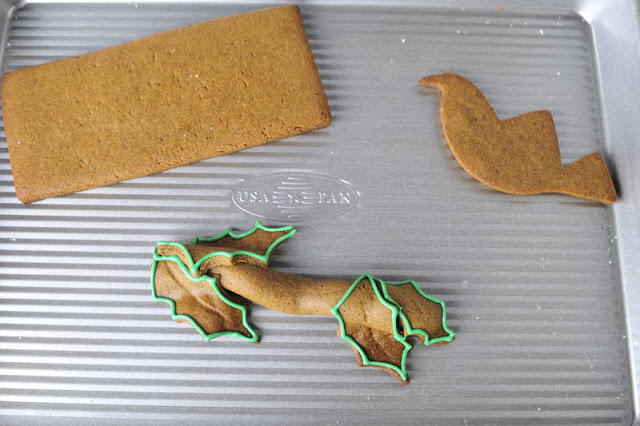 Let the icing dry. 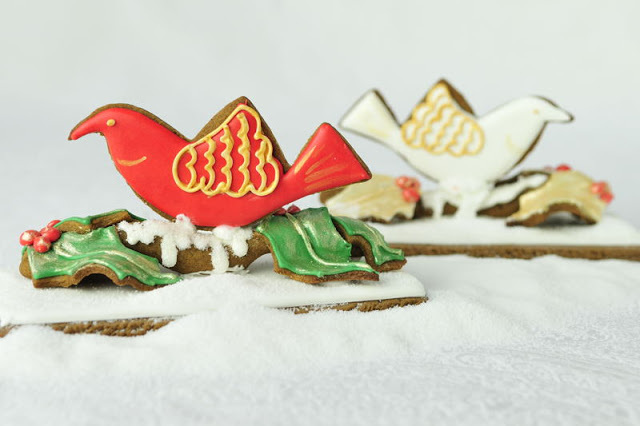 Ice the base cookies and dove cookies with icing. 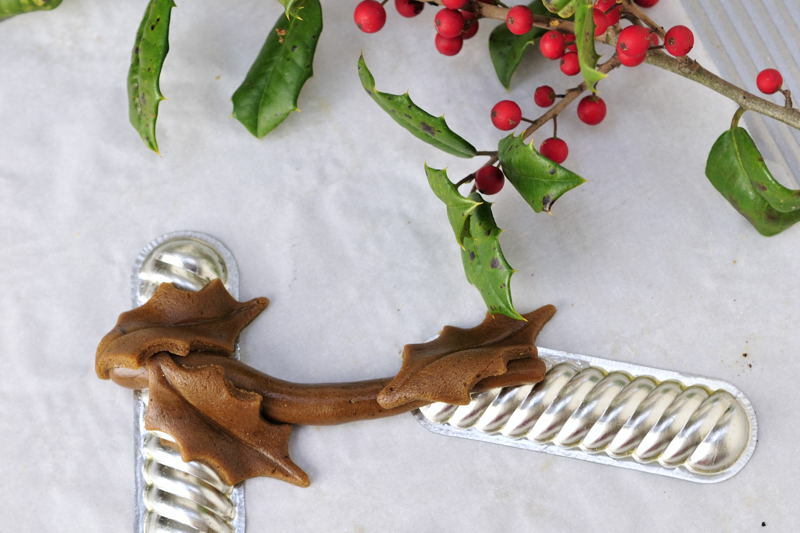 Pipe details onto holly leaves, let dry and then paint with gold luster dust. If you are not familiar with luster dust, visit my Luster Dust Tutorial,look under Wet Application. If needed use a template as a guide to pipe the wing on the dove. Let it dry and then paint with luster dust. 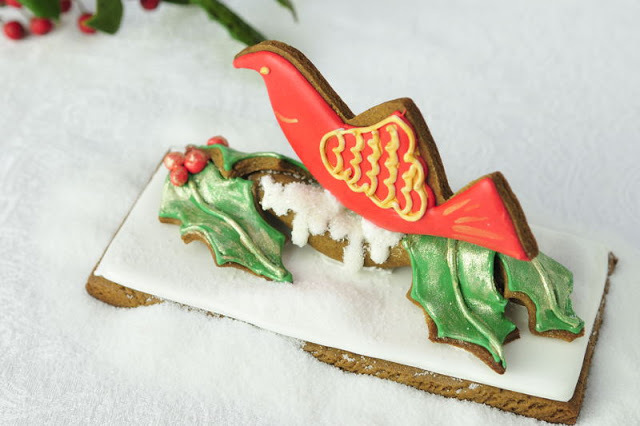 Ice a piece of a holly branch and sprinkle with sparkling sanding sugar. Using several support pieces like crumbled plastic wrap or aluminum foil to assemble the centerpiece, using stiff royal icing. Don’t forget to attach branch onto the base with icing as well. I’m giving most of my centerpieces as gifts to our friends but these 2 I’m keeping. I enjoy looking at them. There is something serene about them.They have a calming nature.